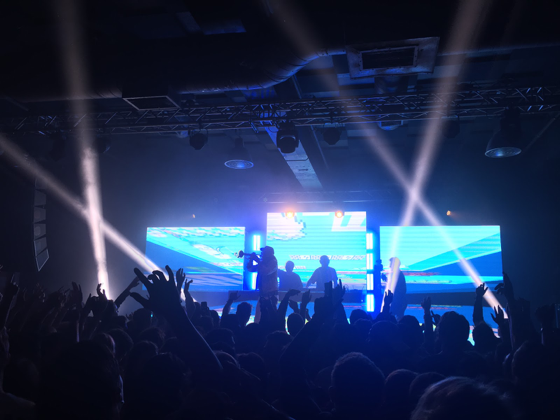 A sold out crowd screamed back the EDM noises booming from the stage where Eli Stones and Matthew Halper stood, bouncing up and down with a type of energy that sent waves of electricity throughout the entire audience packed into Concord Music Hall. Halper and Stones, the duo that make up Two Friends, began their set with a throwback to 2002. “Without Me” by Eminem vibrated the room while a bold “2 F” filled their video wall, causing fans to scream with anticipation. The video wall would be used a lot that night with psychedelic journeys, lyrics, different dazzling displays of color, and emojis appearing at some point or another throughout the entire night. The entire evening followed the same pattern: a well known song began to play and the crowd yelled in excitement and recognition, while somehow simultaneously also emphatically singing along. Eventually, the Two Friends remix kicked in and when the bass dropped - everyone went wild. Hit songs came one after another from “iSpy” to “Hey Ya” to “Mr. Brightside” — some twenty odd years of music history coalescing into one set. One room. One large group of individuals jumping up and down, pouring their hearts out to every song. At one point in the night, Two Friends became three friends, and then four friends as a saxophonist and a trumpeter joined them on stage for their iSpy remix, as well as a hearty saxophone version of Mo Bamba. The reason why the Two Friends concert was so enjoyable for seemingly every person in attendance is because of the group’s omnivorous musical appetite - they appreciate and reimagine such a wide array of music. The duo is an incredible introduction to EDM for any newcomer to the genre because it is more than just noises and heavy bass - it’s music that is stylized in a unique way, allowing anyone to enjoy the lyrical and electronic version combined into one. The live taste of a trumpet and saxophone only added more to the Two Friends set as it complemented their electronic craft with raw musical talent aspect — a reaction to the common critique that DJ’s just hit buttons and press play. The duo also engaged with the crowd throughout the entirety of the night and had a contagious enthusiasm that was hard to match. The night ended with a shower of confetti, a group picture, and then the playing of their two singles, “Take it Off” and “Just a Kid.” The pair have started the process of becoming big. By producing remixes and with the growing popularity of their Big Bootie Mixes on Soundcloud, they are making a name for themselves. As they move away from remixes and towards the development of their own singles, we will see if they can continue to grow in popularity, or if they will be stuck remixing songs already created by someone else. If you have an opportunity to see Two Friends, I 100% recommend going. Whether you like EDM or not, the show they put on is incredibly enjoyable for everyone. Do yourself a favor, and take the time to see them live.